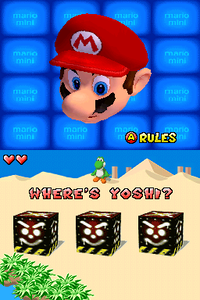 Tox Box Shuffle is one of Yoshi's minigames in Super Mario 64 DS, based on the shell game. It involves three Tox Boxes, one of them trapping Yoshi underneath itself. The Tox Box then shuffles around with its partners, making it hard for the player to tap the correct Tox Box to free Yoshi. As the game goes on, the Tox Boxes go faster, and one more Yoshi (a Light Blue Yoshi) gets trapped. As both Yoshis get trapped, the player will have to get the correct Yoshi, making him or her have to keep track of all Yoshis. The game ends when the player guesses incorrectly twice during a round. This Minigame features a floating Mario head. The Mario head will laugh when the player finds a Yoshi. Oh no! Yoshi's trapped in a Tox Box! Find which one he's in to save him! German Wo ist er? Where is he? Italian Dov'è finito Yoshi? Where is Yoshi? This page was last edited on April 7, 2019, at 23:56.